Butter chicken is a hugely popular Indian curry that results in a rich and creamy gravy that is almost buttery. It is incredibly easy to prepare, needing only a few minutes of chopping and pan cooking. After that, everything simmers. You only need to stir in a bit of cream at the end and cook some rice. 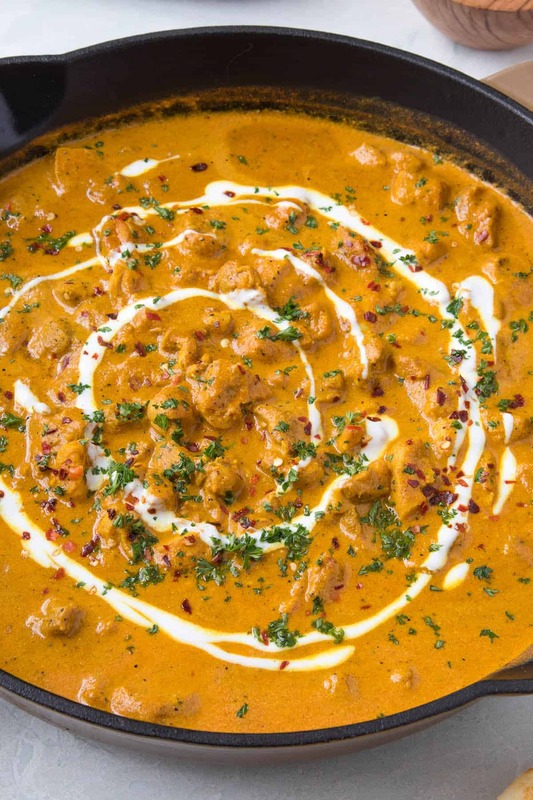 My butter chicken recipe goes heavy on the spices for you. If you’ve ever dined at an Indian restaurant, you’ve most likely tried Indian Butter Chicken. It’s massively popular, one of the most well known Indian recipes in the U.S. It is rich and filling, comfort food at its finest, and you can easily make it from the comfort of your own kitchen. One of the best things about it is you can cook it up with ingredients easily found at your local grocery store. Just don’t let the aromas drive you mad with desire as they fill the house. And, even though it is a curry, it isn’t spicy hot, even though it does include a lot of piquant spices. 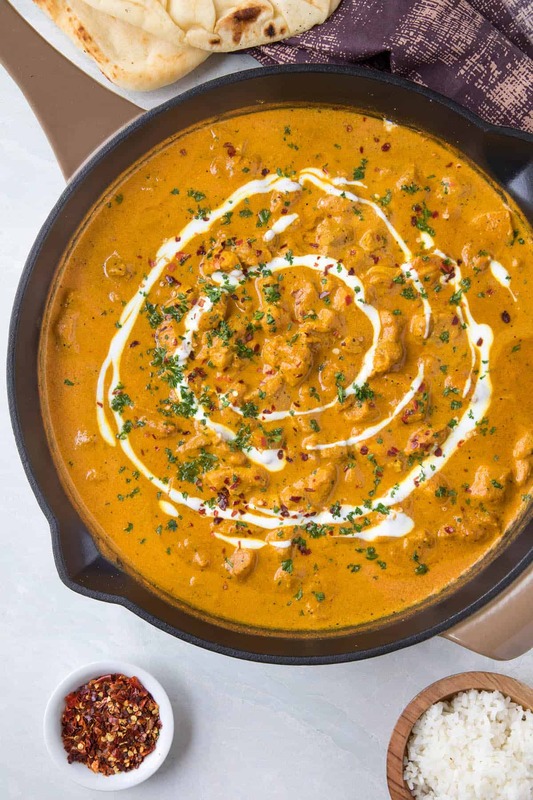 If you love curry but you don’t love the heat, butter chicken is the dish for you. Don’t worry, though, my spicy food loving friends. You’ll love it, too. Butter chicken is filled with big, bold flavors. And, you can adjust with heat to your tongue’s desires. 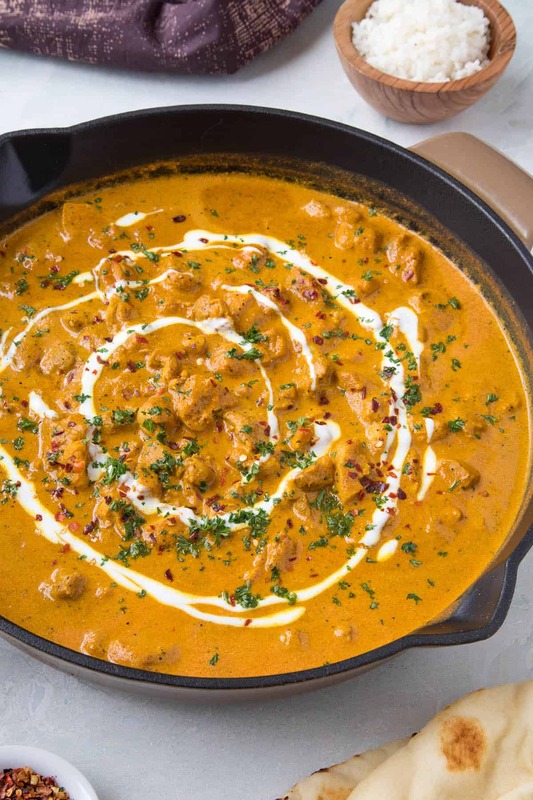 Butter Chicken is a curry made with tender, juicy chicken that marinates in yogurt and lots of aromatic spices. It is then cooked along with aromatics and extra spices along with a tomato-based curry sauce. 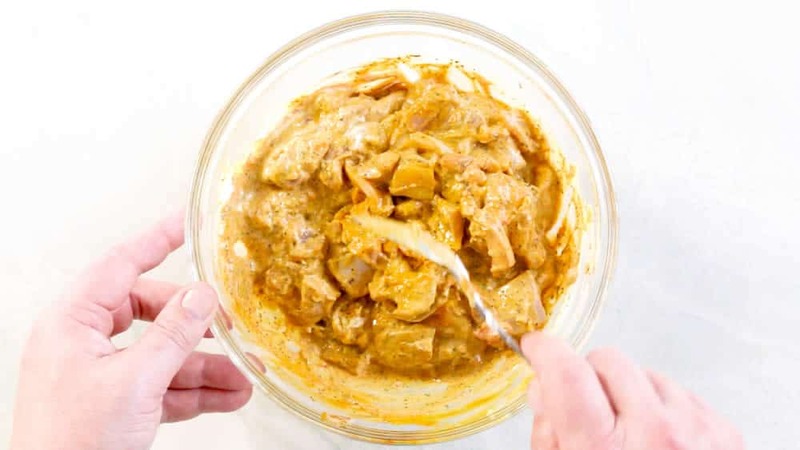 The curry sauce is later strained, making it smooth and velvety, then finished off with a bit of heavy cream to bring you a wonderful creamy chicken curry dish. I don’t think you can get any better than a good butter chicken. Indian food at its most wonderful. 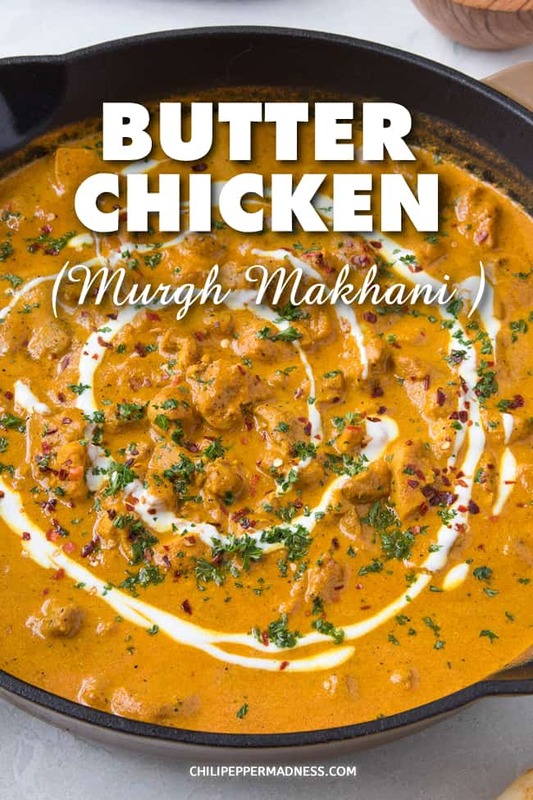 Butter chicken is the common name, but it is called “Murgh Makhani” in India. It is rather similar to another well known Indian dish, Chicken Tikka Masala. Let’s talk about how we we make it, shall we? First, chop your chicken into bite sized pieces. You can use either boneless, skinless chicken thighs or chicken breast for this recipe. Add the chopped chicken to a medium bowl. Add all of the marinade ingredients, and stir to completely coat the chicken. Cover the chicken and set it in the refrigerator to marinate for at least 30 minutes. You can marinate overnight for greater flavor penetration. When you’re ready to cook, heat a large pan to medium high heat and add the olive oil. Add the chicken and cook for 5 minutes, stirring, until the chicken is browned. Add some butter to the same pan and let it melt. Add in 1 chopped onion and 1 chopped red pepper. Cook them 5 minutes to soften. Add 3 cloves minced garlic and 1 tablespoon fresh grated ginger and cook 1 minute, until they become fragrant. Add garam masala, cumin, red chili powder, salt and pepper, and red chili flakes (if using). Stir and cook for 1 minute. 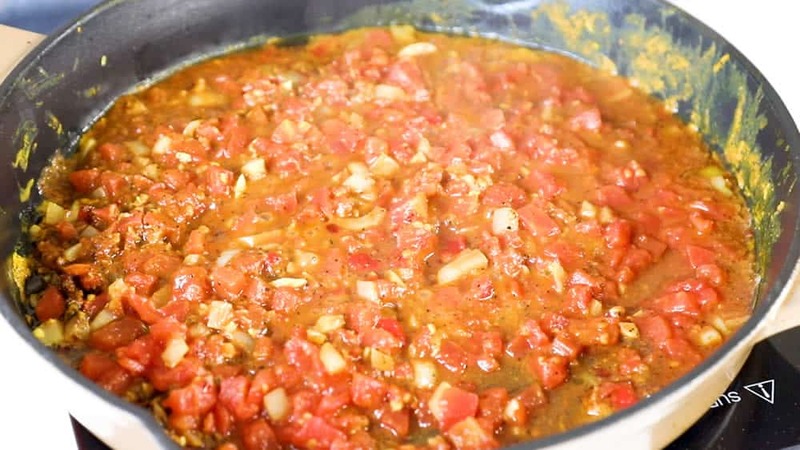 Stir in 14 ounces diced tomatoes. You can use fresh, tomatoes, canned tomatoes, or tomato sauce. Bring the mixture to a quick boil, then reduce the heat and simmer for 15 minutes to break everything down. 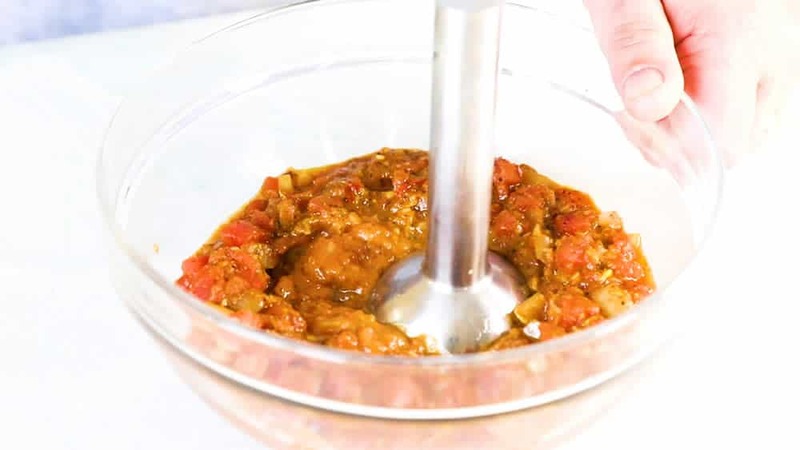 When the sauce is ready, transfer it to a blender or food processor and process until smooth. You can thin it out with a bit of water if you’d like. Strain the sauce back into the pan. The point is to make the sauce very smooth and heat through. Stir in 1 cup of heavy cream (or use milk for a lighter version). Heat and simmer for 10 minutes, or until the chicken is cooked through and the sauce thickens up a bit. Serve with cooked white rice. Basmati rice is great here. I love it with rice and naan. Garnish with fresh chopped herbs (parsley or cilantro), and spicy red chili flakes, if desired. Swirl on a bit of extra cream. It really is such a hugely flavorful dish. 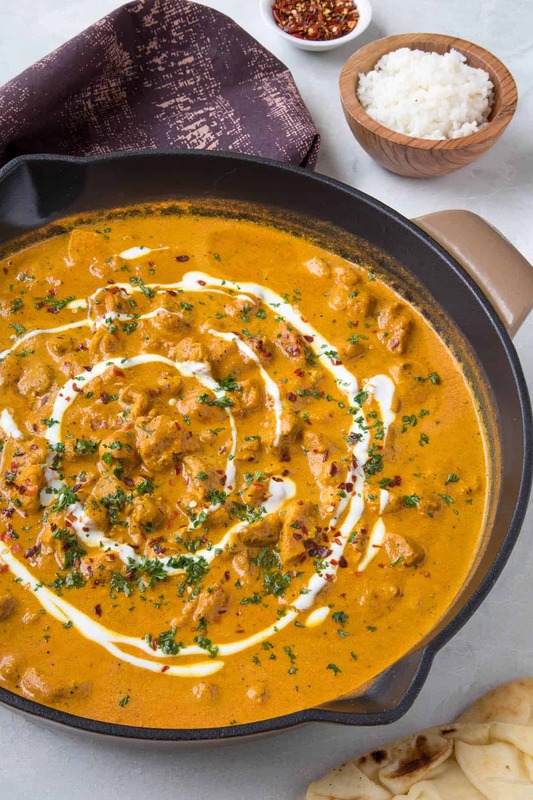 We’ve both been exploring all sorts of different spicy curry recipes, both cooking and eating, and I think you’ll love butter chicken, if you don’t already! It’s quite fun, actually, to make at home. I hope you have as much fun as I do. Chili Powers. Kashmiri Red chili is traditional for the red chili powder, though you can use paprika, which is more easily found. Common Butter Chicken Spices. Coriander and cardamom are often used, as well as fenugreek, though I don’t include them in my recipe. Garam masala is a must, as is turmeric, along with fresh garlic and ginger. The Heat Factor. I include spicy chili flakes in my recipe, but that is optional. Only if you’re looking to add a bit of a kick to the final dish. If you’d like a spicier version overall, incorporate hotter chili peppers when cooking them down with the onion. Jalapenos or serrano peppers are great for this. Try it with a habanero pepper for some real heat. You can also use spicier chili powders, like cayenne. Cashews are Wonderful. 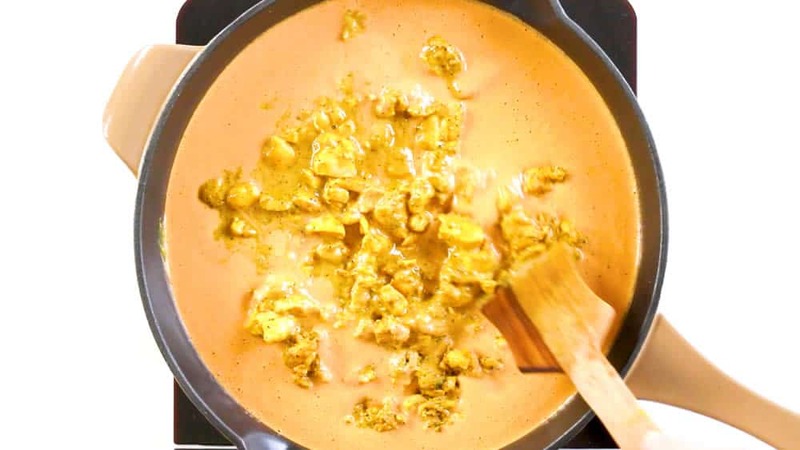 Ground cashews or cashew paste can be used as a thickener, as well as a flavor builder, which is a big component of Indian Chicken Korma. Go Crazy with Spices. As a spicy food lover, you can easily adjust the ratios of seasonings used. Feel free to include more if you’d like. Add Veggies. Of course chicken is the primary with butter chicken, but you can easily round out the meal with the addition of chickpeas, sugar snap peas, cauliflower or any other of your favorite vegetables. You can also make it with other proteins as well. 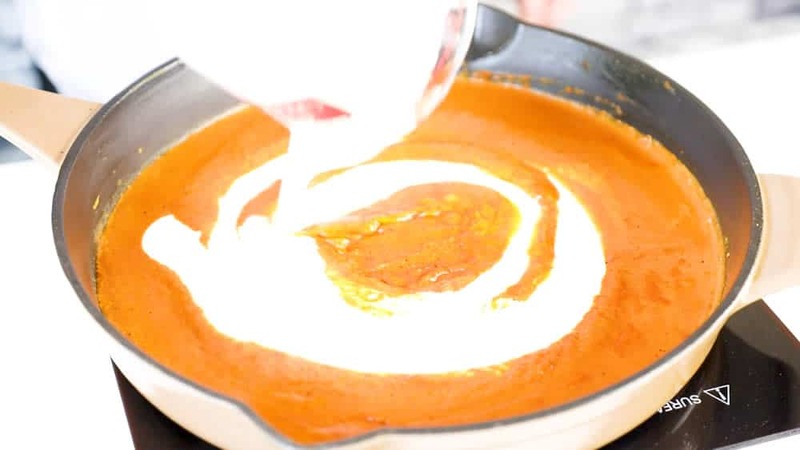 Butter chicken sauce is made from tomato, onion, peppers and lots of seasonings, including fresh ginger and garlic. 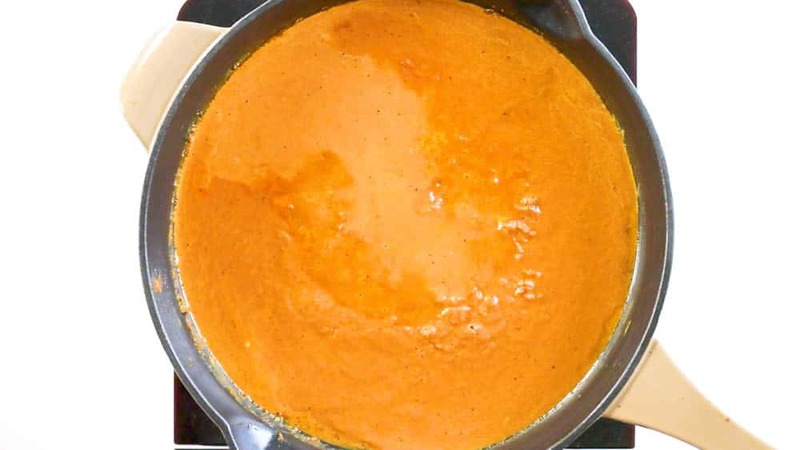 The sauce is cooked down in the pan, then processed with a food processor or blender until very smooth. From there, heavy cream is added to bring it to its butter-like consistency. Key here is processing the sauce, then straining out the solids. You can skip this step if you’d like but you won’t achieve that silky smooth quality that butter chicken is known for. Canned tomatoes are completely acceptable with butter chicken. Heavy cream is a common component, but if you’re looking to make a lighter version, use either milk, yogurt, or sour cream instead of heavy cream. If you’d like to learn how to make this recipe in a slow cooker, I make a spicy version with serrano peppers in my cookbook, “The Spicy Food Lovers’ Cookbook”. You can purchase the book from major online retailers. Why is Butter Chicken Called “Butter Chicken”? The name derives from the fact that butter is used in the curry sauce. Butter is not normally used in curry, which changes the flavor. Also note that the chicken pieces are prepared in a butter (makhani) gravy that includes butter and cream. This gives the recipe its smooth, silky texture. The name “Murgh Makhani” translates to “chicken with butter”. 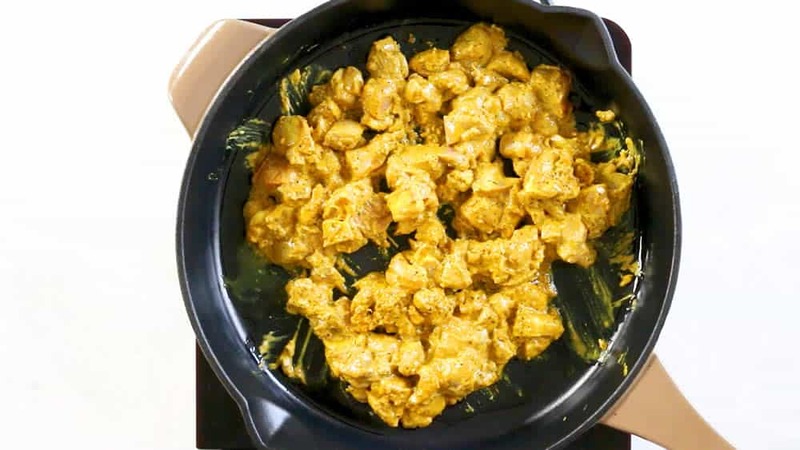 There is some butter in this recipe, but butter isn’t actually needed to make butter chicken. You can easily replace it with olive oil if you’d like, and you won’t lose any flavor or texture. That’s it, my friends! I hope you enjoy this amazing butter chicken. It is incredibly delicious. Drop me a line if you have any questions. Add the chopped chicken to a medium bowl. Add the garlic, ginger, garam masala, chili powder, turmeric, cumin, salt and pepper yogurt and lemon juice. Stir to cover the chicken. Cover and set in the refrigerator to marinate for at least 30 minutes. You can marinate overnight for greater flavor penetration. Heat a large pan to medium high heat and add the olive oil. Add the chicken and cook for 5 minutes, stirring, until the chicken is browned. Remove the chicken and set it aside. Melt the butter in the same pan. Add the onion and peppers and cook them 5 minutes to soften. Add the garlic and ginger and cook 1 minute, until they become fragrant. Add the garam masala, cumin, red chili powder, salt and pepper, and red chili flakes (if using). Stir and cook for 1 minute. Stir in the diced tomatoes. Bring to a quick boil, then reduce the heat and simmer for 15 minutes to break everything down. Transfer the sauce to a blender or food processor and process until smooth. You can thin it out with a bit of water if you’d like. Stir in the cream and add the chicken back to the pan. Heat and simmer for 10 minutes, or until the chicken is cooked through and the sauce thickens up a bit. Serve with cooked white rice. Garnish with fresh chopped herbs (parsley or cilantro), and spicy red chili flakes, if desired. Swirl on a bit of extra cream. Calories are estimated without rice or naan. 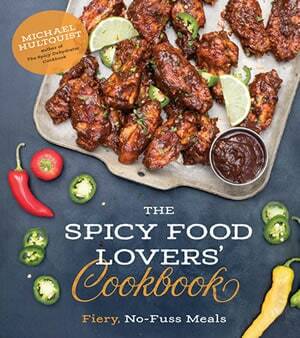 Mike Hultquist is the author of “The Spicy Food Lovers’ Cookbook” and “The Spicy Dehydrator Cookbook“.